If I am not mistaken CT was not designed as a Markdown editor, it is much more than that. Consequently, you should not compare Smartdown & CT. Or am I mising something? I like the look of the Mac app, and the menus are (for me anyway) a new thing with Markdown apps. I could not find a Format Panel or Goals and Statistics. And the date, even after I removed the file-name prefix info, reads as March 69, 2015. Pretty clearly a work in progress. ConnectedText is not a Markdown application. It uses a dialect of Wiki Markup (which is close to Markdown, but to my mind mostly superior to it). Just figured it out. The panel appears with a right-click. The goals and stats are hiding in the word count. To MK - CT is not a Markdown application. I fully agree so why do you compare CT with Smartdown? SD is just a text editor, CT is much more than that. Copmarng the 2 is like comparing apples with pears. I like apples better than pears! Pears are too sweet. 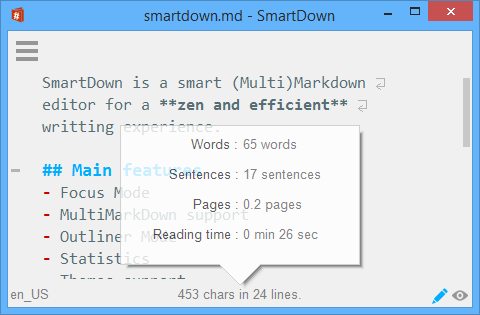 Similarly, I prefer to use ConnectedText for things that I (and others) could use Smartdown for.